Leftroom Ltd follow up the re-release of Landshark’s ‘Tie Me Up’ with ‘Blind To The True’ by Shall Ocin featuring remixes from Fist Or Finger man, Jozif. Shall made his debut on the Leftroom roster last summer on the Left’d sub-label before dropping ‘Tribute To Summertime’ on Leftroom in October. Since then, the Argentinian producer has released EPs for Alive and LA’s Droog. 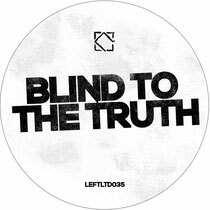 ‘Blind To The Truth’ sees Ocin delve further into his penchant for airy melodies, elastic basslines and funk- laced grooves, turning out a melodic vocal infused track. ‘Breaking Chains’, feat Mireia, is similarly funky but a slightly moodier and punchy affair due to some seriously weighty bass hooks. Jozif, an artist who has made his name with his collaborative label with Craig Richards and releases for the likes of Droog and Leftroom, delivers two remixes of ‘Blind To The Truth’. His ‘Blind’ remix focuses on the original’s bass work while his ‘Blinded’ remix strips things back to a lighter, subtler but equally as melodic tone.